St. Patrick’s Day has been celebrated in Ireland for over 1,000 years, but it was mostly a religious celebration of the Saint’s life and deeds. Today, many people of Irish ancestry in the U.S., and many others who consider themselves “Irish for the Day” spend March 17th each year wearing green, watching parades and otherwise participating in this celebration of all things Irish. St. Patrick, the patron saint of Ireland, brought Christianity to Ireland in about the early 5th century. Patrick was from a wealthy family which lived in Roman Britain. He was brought to Ireland as a slave at about age 16. Having spent about half dozen years there he finally made his way to freedom, eventually entered the Church of Rome, and was sent to Ireland as a bishop. There, he is credited with performing many baptisms, and converting people to the Catholic Church. St. Patrick is said to have used the shamrock to explain the Holy Trinity. There are many millions of people of Irish ancestry in the United States, as well as Canada, Australia, and England. During the Great Famine of 1845 to 1849, there was a blight of the potato crop in Ireland. Potatoes were the sole diet of millions of the Irish people, who subsisted on nothing else. When the potato crop failed for four years in a row, millions of people starved to death, or died of disease, such as cholera and typhoid, while many of the population emigrated away from Irelandto find work and a better life for themselves. In America discrimination was rampant, with many “Help Wanted Irish Need Not Apply” signs in business windows. Numerous Irish women and girls entered domestic service, and many men entered the police and firefighting forces. The first St.Patrick’s Day parade was held in New York City in 1762, before the famine. The participants were Irishmen serving in the British Armed forces. Today New York, Boston, Chicagoand San Franciscoall have St. Patrick’s Day parades. The U.S. state with the largest percentage of people of Irish ancestry is Massachusetts. One of Ireland’s biggest influences in the U.S. may be on our Country Western and Bluegrass music. The jigs and reels of Ireland were played in the rural South, and can still be heard today in their original form, as well as being a major influence on our popular music. 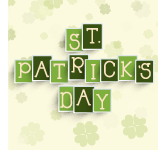 St. Paddy’s Day comes from the Irish name Padruig, or Patrick.